The KFR-50QIW/X1c-M is a cassette air conditioning inverter heat-pump with (5 kW / 18000 Btu) cooling and heat capacity. The KFR-50QI cassette heat pumps are designed for light commercial and residential use but do find themselves installed on professional projects such as server rooms and COM's rooms. The KFR-50QIW/X1c-M is the latest in inverter heat pump air conditioning technology with a DC powered compressor which keeps the temperature more linier and generally runs the compressor constantly at a low input power level. 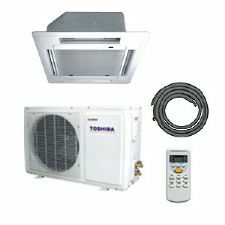 The EasyFit Cassette Air Conditioning Heat Pump Inverter KFR-50QIW/X1c-M (5 kW / 18000 Btu) 240V~50Hz model which was introduced by Midea/Airconditioningcentre in 2013 comes with a 6 meter pipe service as standard which is pre lagged with insulation, cable and small drain hose. These can be extended with a jointing union which comes with the 2, 4 or 6 meter extension kits which are available. The KFR cassette range is aimed at the electrician, plumber and general builder market and is very popular in new builds or for space heating in office heating / cooling environments. Even though it's relatively cheap price tag the KFR cassette units are of reasonable quality with powder coated protection on the outdoor condensing unit and ridged frame. The indoor unit is finished in ivory white fascia panel. The indoor unit is only 354mm deep so it can be installed in reasinably tight cealing voids. The air conditioning remote controller is a standard LCD display type with 3 mode function (heat / cool / auto) with multi function fan settings for the indoor unit.